Do you covet a cosy hearth and spend the darker months drawn to flickering flames of a revived fireplace or newly installed state-of-the-art wood burning stove? Now’s the time to consider your stove or open fire set-up. Open fires and wood burning stoves have rekindled a deeply romantic sense of the heart of the home. The recession, laced with a rustic revival in ‘make do and mend’ has fuelled the desire for more economic ways of heating our houses. Heritage house dwellers along with more modern home owners are once again comfortable with compartmentalising the warmth in individual rooms and many are firing up the central heating less frequently. Now and then, we find that once widely used historical designs have been lost in a hiccup in practical or fashionable usage. The advent of central heating as well as domestic gas and electric fires in the late 19th century left millions of Victorian then Edwardian through to late 20th century home owners with redundant wood and coal-burning fireplaces and kitchen stoves. As a knock-on effect, fireguard manufacturers had to turn to new product ideas as old screens were discarded and not replaced. One of these items, the sturdy Victorian Nursery Guard, with a proven safety record, was consigned to the scrap heap. But read on, this vital bit of domestic kit is making a come back! The recent nationwide adoption of wood-burning fires in British homes has been so fast and the accessories industry is busy playing catch-up. We’ve been mindful that families and pet-owners sometimes think twice before they indulge in this new feel-good focus for living rooms, kitchens and more open-plan layouts. We’ve also noticed that stylish, well-designed and very sturdy fire screens have been hard to come by. To this end, Garden Requisites manufacture and directly supply handcrafted wirework fireguards inspired by the original Victorian Nursery Guard. We also produce more contemporary fireguard designs and optional spark screens and side fixings. If you are safety conscious fire and wood-burning stove guardians who have inquisitive young children or pets (either as visitors or your own) or if your stove/fire is positioned in a well-frequented hotspot, do consider some tasteful fire screening. A welcoming hearth or stove in a country house or cottage is now on the tick list for the majority of house buyers. The sense of welcome doesn’t have to be diminished by inferior and industrial looking and sometimes not-so-safe folding fire screens. Indeed, the look can be enhanced with a well-fitted guard that can be made to measure if none of the standard sizes are suitable. To fan the inspiration flames further, we’re building a Traditional Metal Fireguards pinterest board. Save some reference images for your fire projects and watch for new designs as they’re forged. 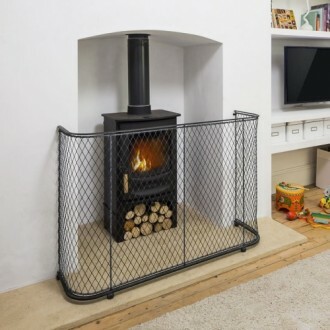 Garden Requisites’ fire guards are handcrafted in zinc galvanised solid steel that can be painted or finished with a more mellow patina in aged zinc. Our workshop is located near the beautiful city of Georgian Bath in Somerset, England (which boasts its fair share of fine 18th century abodes that feature some grand old original fireplaces). We can also deliver worldwide so if you experience cold winters and are finding it tricky to locate a well-made guard or need a good design that’s made to measure, do get in touch. Put another log on the fire for us and stay safe!